While trying to deal with my vision loss I struggled with comments from others. Comments like: what they believed I would and wouldn’t be able to achieve with my level of vision. There were days when I would believe what was being said, I would admit defeat and question whether I was making the right choices. How often do we hear that we can’t or shouldn’t be able to do something because of our vision? This belief can come from family, friends, medical professionals, strangers and even ourselves. Through my vision loss journey with my cane Hawkeye by my side, I’m learning if there’s a will there’s a way. There just might need to be some modifications needed along the way. While trying to deal with my vision loss I struggled with comments from others. Comments like: what they believed I would and wouldn’t be able to achieve with my level of vision. There were days when I believed what was being said. I would admit defeat and question whether I was making the right choices. Other days the comments would frustrate me and I became more determined than ever to prove them wrong. I once had an educational manager inform me I was making the wrong choice in wanting to become a programmer. As far as he was concerned I wouldn’t be able to use a computer. He believed this in spite of my attempts at explaining about the technology that was available. Going home that day I was upset by his comments and started to doubt myself. Thankfully, I turned those doubts around and backed myself. As a result, I’ve been working as a programmer at Skytrust for the last ten years. Like a lot of people, I struggled to accept the fact that I needed to use a cane. I was certain that I could get by without one and I tried hard to prove it. However, when walking without using a cane my posture was terrible, and my neck was in a lot of pain from staring intently at the ground. To help come to some level of acceptance to use my cane I decided it needed a name. Inspired from one of my favourite tv shows M*A*S*H I chose the name Hawkeye. Soon after I decided Hawkeye needed some eyes, and with this, I started taking photos of his adventures for a bit of fun. As Hawkeye’s personality developed, my acceptance of using him improved. an Instagram account, @HawkeyesTravels, for him. It was created to show a lighter side to vision loss as well as to show that anything is possible despite the challenges we might face. If you have seen his Instagram account, you will notice that in most of Hawkeye’s photos he is in focus while the background is blurry. I have done this intentionally to give an example of what it might look like for someone with a vision impairment. I am always looking for new ways to challenge myself and show others what can be achieved even with a vision loss. 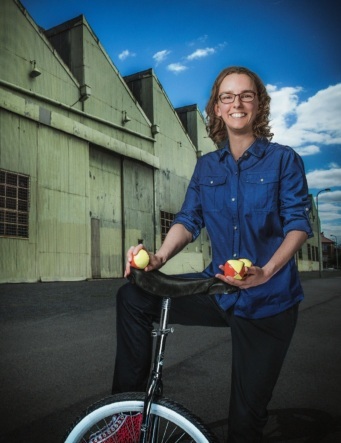 Last year I bought a unicycle so that I could teach myself how to ride it. Whilst I currently can’t ride it without holding onto a handrail, I believe that with enough practice and determination I will one day be able to ride it without holding onto something. This year I have also been teaching myself how to juggle. Currently, I can juggle three balls and given enough time I will be juggling more. My goal is to one day be able to ride my unicycle and juggle at the same time, while it won’t happen overnight it will happen someday. In previous years I have been shark cage diving, go karting, horseriding, climbed Sydney Harbour Bridge, and travelled to different countries around the world to name a few activities. As for what I will try to learn or attempt next? In the short-term it looks like sword fighting or fire eating. Long-term I haven’t decided yet, but I am certainly excited coming up with all kinds of different ideas. While I know it’s not easy to ignore the doubters, remember to back yourself—you have got this! Shark Cage – Cassie is underwater in a shark cage wearing goggles and breathing apparatus. Additional air hose tubing can be seen floating above her head. Cassie & Hawkeye – In this image Cassie is posing with Hawkeye to her left (who’s looking a tad shifty-eyed) and a dog in front of her. Cassie is smiling broadly and wearing a ballcap, sunglasses, and a gray hoodie. Typically on Blind Beauty, we feature photos and words of wisdom from beautiful blind & visually impaired women. 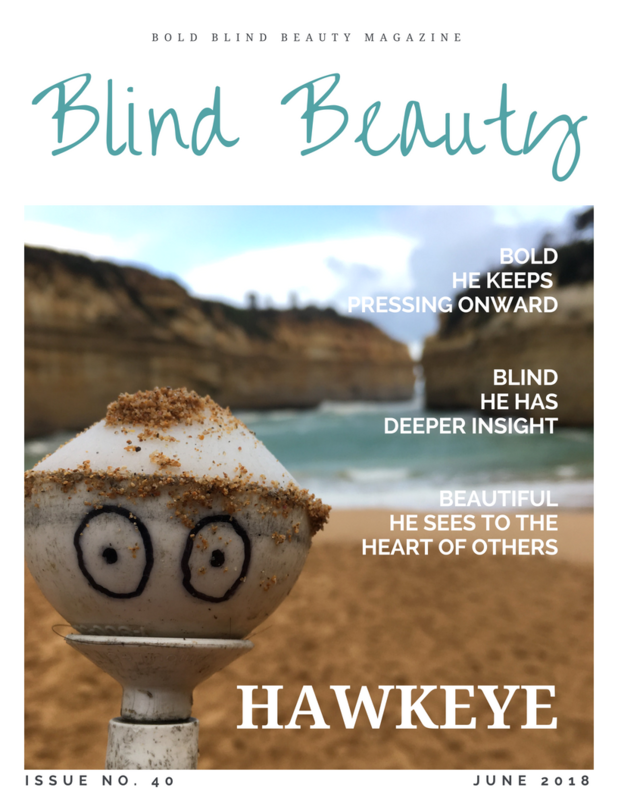 Today’s Blind Beauty Issue 40 is a little special as we present, a rising star, Hawkeye, of Hawkeye’s Travels. Many people think inanimate objects have no thoughts, feelings, or opinions. Between me, you, and the internet, for the love of all things sacred, please, please do not tell Hawkeye. This is one personable, well-traveled white cane. Not only does Hawkeye help Cassie navigate the world, he does so with a humorous flair. When you visit Hawkeye’s Instagram account you’ll notice the majority of the pictures have a blurry background. These images attempt to simulate what it is like to not see clearly. Hawkeye is a white mobility cane with a rolling ball tip. What makes Hawkeye stand out from other rolling balls are the eyeballs on the ball. When Hawkeye is doing a photo shoot, the ball is in an upright position to show us his facial expression. We hope you enjoy this small sampling of Hawkeye’s travels. Found my name on a sign, it was only a matter of time. The word “Hawkeye” is in white letters on a large hanging sign in the background of this photo. Getting down and dirty in the rainforest. Forest debris covers Hawkeye’s head. That awkward moment when you are out and about and a shark tries to eat you… A large poster of Jaws appears to ready to chomp down on Hawkeye’s head. Help! I’m being attacked by leaves!! It’s that time of the year again when Cassie manages to walk in all of the piles of leaves, definitely must be autumn. Autumn colored leaves surround Hawkeye. When you want to have your picture taken at a magic show and someone gives you bunny ears… Two fingers are behind Hawkeye’s head. In the background is a magic show stage setup. Getting into the Christmas spirit with some tinsel and lights. Our snazzy looking Hawkeye is wearing green tinsel. Having breakfast with the Roos. In the background are two kangaroos. You can follow Hawkeye on Instagram at @hawkeyestravels.